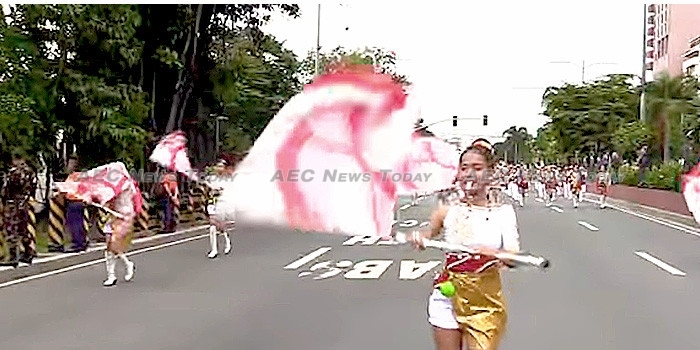 Flags, musical horns, dancers and a grand parade were the order of the day on Tuesday, August 8, when Asean celebrated its golden jubilee. Organised by the government of the Philippines – the current chair of Asean – in collaboration with the National Commission for Culture and the Arts (NCCA), the Department of Foreign Affairs and other government units, Asean’s 50th anniversary celebrations took place with street parades and a formal evening event attended by the foreign ministers of Asean’s ten member states and range of visiting dignitaries. The Manila street parade began at 3pm, led by flag-waving dancers, followed by the Presidential Security Guard (PSG) marching band, and higantes decked in Asean costumes, and sections for all member nations. Against a backdrop of tight security the procession marched from from Rizal Park in Manila to the Cultural Center of the Philippines (CCP) in Pasay City, for a landmark ceremony at which the Asean lantern was lit to officiallyto commemorate Asean’s 50th anniversary. The theme for the evening, was ‘Under One Light, We are One Asean’. At 7pm headlining Asean musicians – Filipino singer Christian Bautista, Myanmar’s Eint Chit, Cambodia’s Kong Sothearith, Thailand’s Natthika Iamthamai, Brunei’s Afiq Wafi, Vietnam’s Hai Nam Le, Indonesia’s Ismi Halida, Malaysia’s Dhiya Suhaili Binti, and Latchana Anoulack of Lao PDR – gathered together on one stage at the Bonifacio Global City High Street in Taguig to mark Asean’s 50 anniversary in music. Christian Bautista said that despite the diversity of cultures and languages among Asean members, music can bring them closer together. Meanwhile, in a speech at the Philippine International Convention Center (PICC), to mark Asean’s 50th anniversary, current Asean chair and Philippine President, Rodrigo Duterte, said “prosperity must be a blessing enjoyed by all, not the right of a chosen few”. Similar events to mark Asean’s 50th anniversary were held in 63 other cities across the Philippines, each with their own distinct ceremonies and celebrations. Founded in 1967, Asean was originally established by Indonesia, Malaysia, the Philippines, Singapore and Thailand. Since then Brunei Darussalam, Viet Nam, Lao PDR, Myanmar, and Cambodia have been admitted as its members. Timor Leste is the latest country whose membership is currently under consideration by the remaining members. The association was created to foster economic integration and growth among its members, as well as regional stability using the ‘Asean Way’ – a consultative and consensus-based decision making process that subscribes to a non-interference policy in other member countries and which requires full consensus on all matters.